Four ASTM standard methods (ASTM D4629, D5762, D6069 and D7184) are used to determine the total nitrogen in naphtha range samples, and other trace nitrogen containing liquid hydrocarbons can also be determined. The standard methods D4629 and D5762 are performed at atmospheric pressure. ASTM D6069 and D7184 are performed under reduced pressure and require a trace nitrogen kit comprised of a vacuum pump, a needle valve for pressure control and a restrictor to regulate the ozone concentration in the reaction chamber that would impact measurement sensitivity. The determination proceeds according to the combustion reaction in all cases as shown in Equation 1, followed by chemiluminescence of the nitric oxide as shown in Equation 2 and its relaxation and emission of the characteristic infrared energy as shown in Equation 3. The SO2 fluorescence signal is strongly quenched by water formed in the combustion process in case of a simultaneous S detection as well as the chemiluminescence reaction, so combustion gases are routed through a membrane drying system in order to remove the water after the combustion reaction (1) takes place. Detection is equimolar and linear with a dynamic range higher than 103. Figure 1 shows the AntekMultiTek® Vertical configuration with nitrogen detection and liquid autosampler. The operation parameters for the analysis are shown in the table below. If the system configuration does not have a vacuum system, the scope of the analysis corresponds to D4629. At lower pressures very low trace levels can be reported as 0 mg/Kg if a calibration like the one shown in Figure 2 is done. Based on ASTM D718, calibration was achieved with toluene standards with acridine as the nitrogen source at atmospheric pressure. Figure 2 shows the results. The standard addition method was used to study two hydrodesulfurizednaphthas, one reforming feed, one reformate and one hydrocarbon solvent. This sample set is characterized by having very low amounts of nitrogen falling below the LOQ of D4629 in the majority of cases. When samples were studied against the calibration curve of Figure 2, results were reported as zero mg/Kg of N.
Standard addition comprises spiking replicates with equal volumes of sample with a few µL of a high concentration stock solution to obtain a calibration similar to Figure 3. The non-spiked sample is known as the blank or zero concentration as analysis proceeds. The method was developed by spiking 10 mL of the sample with 5 and 10µL of a 1000 ng/µL stock solution of acridine in toluene to have 0, 0.5 and 1.0 ng/µL calibration points. Catalytic Reforming to produce high aromatic content components is a process that converts hydrodesulfurizednaphthas into high octane streams for gasoline blending. In order to prevent the irreversible deactivation of costly platinum containing catalysts, these feeds should also contain the lowest possible nitrogen. These feedstock normally contain part per trillion nitrogen levels so the quality control of these materials is very challenging and the analytical instrumentation and method of analysis should be stable, sensitive, stable and consistent enough to prevent serious operational issues. Figure 4 and 5 shows a satisfactory application of the standard addition analysis in a MultiTek® VN to quality control these charges before processing. The method was also applied to determine pure aromatic streams used in petrochemical plants. It was determined that using ASTM D4629 in the MultiTek® VN without the Trace Nitrogen vacuum kit, one can retrieve the values obtained in the standard addition method for those values above the limit of detection calculated for that system. Equivalent results for the analysis of N in a reforming feed naphtha are shown in Figure 6.The plot on the left was obtained in a MultiTek® VN without the Trace N vacuum kit and the one in the right was obtained in a VN instrument at reduced pressure. 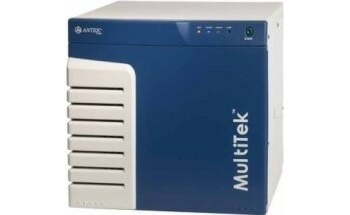 The MultiTek® Analyzer shows the ability to precisely determine very low levels of nitrogen even when the system is not configured with a vacuum pump. Standard addition methods are highly suitable to very low concentration nitrogen samples and easy to set up in a MultiTek® system offering a good alternative to determining trace level nitrogen. Results show high stability with or without the vacuum system. This is probably the only commercial instrument that combines sulfur, nitrogen, and halides analysis all in one. Compact, powerful, automated, and can analyse gas, liquid, or solid samples, it is the perfect solution to today's increasing demand worldwide for quick, precise detection and analysis of contaminants, and corrosive elements. Since MultiTek® offers precise results with high sensitivity and unmatched versatility, it's a valuable process optimization tool that will offer faster ROI and a better bottom line.